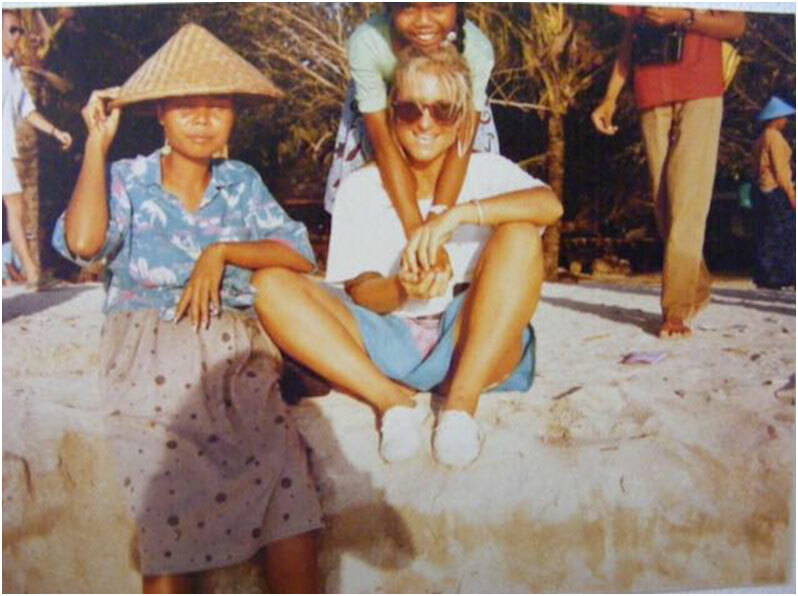 Born in Bondi, discovered Bali in 1978, she has been returning here ever since. Currently she is the owner to the two hippest places to be in Canggu, in Bali for that matter: Crate Cafe, the epicenter of hippsterdom and the best coffee in Bali and Pretty Poison, the retro, ooh to cool for school, surf bowl, ‘Dog Town’ style, local watering hole. Why Bali? Why Canggu? What has changed? Ocean Tribe asked this purveyor of cool and self describe maverick (not to be disputed!) to take a moment and sit down with us to answer a few questions about life, Bali, but most importantly surf and her passion for the ocean. Yeooww! Passion for the water /surf started when? Beach, water morning or night? Sunset. It’s the calming time of the day, to be grateful of the tremendous gifts we’ve been granted and a reminder that you just have to GET ON WITH IT! What inspires you in Canggu, Bali? The sincere smiles of the locals, the benevolence of the community, its creativity and its diversity… I could go on and on. It’s a true cross road of the world. …and of course the ocean. Best Bali memory? Best Bali recollection? There are so many… When I first came here in ’78 we’d chase 3 surf breaks a day between Legian and Seminyak which back then was just miles and miles of palm trees and rice fields. We’d stop off at the only food choices in town, Made’s Warung or Yeoman’s where you might be sitting shoulder to shoulder to Jagger or Bowie (!) but no one would notice. We were all in it together. Also those starry skies and that sense of freedom to live here. It was magical! Bali felt like the yellow brick road… Anything was possible! There are so many… Where do you begin… In those days we’d spend our day in the water because we came here to surf and that’s what we’d do. In Uluwatu you’d have to hike 3k’s through rice paddy fields to get to the beach. There were no roads then. And at the beach, when we arrived, dozen of kids were waiting to welcome us and to help carry our gear to the beach. When we were finished we’d let them use our boards. If we’d stayed the night, we’d camp on the beach under the stars. The silence was incredible. I remember if we wanted to know about the swell, it was the locals who told us, predicted it. There was nothing else to depend on back then. How was Canggu back then? It was known for its left, middle, and right breaks. There certainly was surfing in Canggu but it was only the expats who were mainly surfing then. 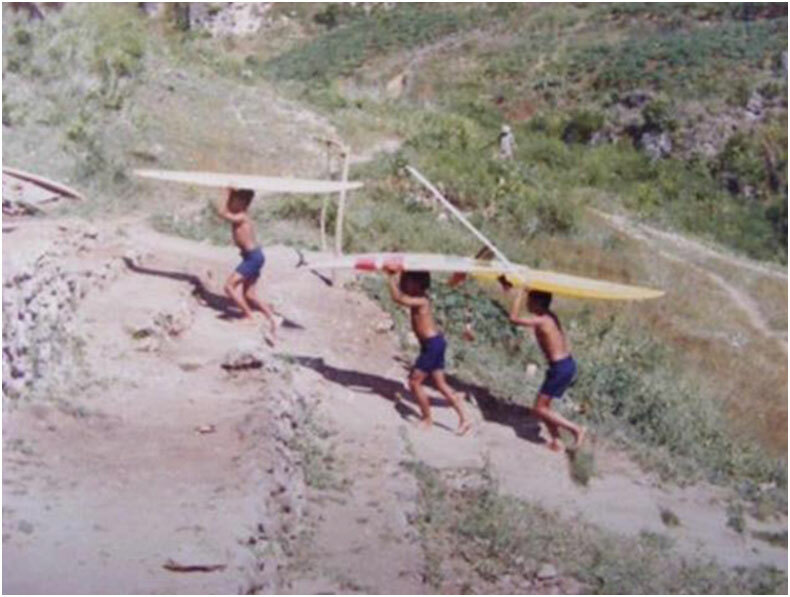 You’d have kids on your boards, many naked… There was not a lot of clothes going on then! How did you get your groove on? There were outrageous parties back then: two day events at Padang Bay or Double Six (only a beach then). You never knew where you were going. Everything was in the middle of nowhere: the jungle! But you just found it. There were no phones on the island back then so each homestay would have these little notepads and you would have to leave a note on each one of them if you wanted your friends to be aware of a party. When you got there, someone would’ve hook up a car battery to a sound system for music and everyone was dancing. Bob Marley, The Doobie Brothers, Steve Miller Band and of course KC and the Sunshine were the favorites. What was your uniform then? 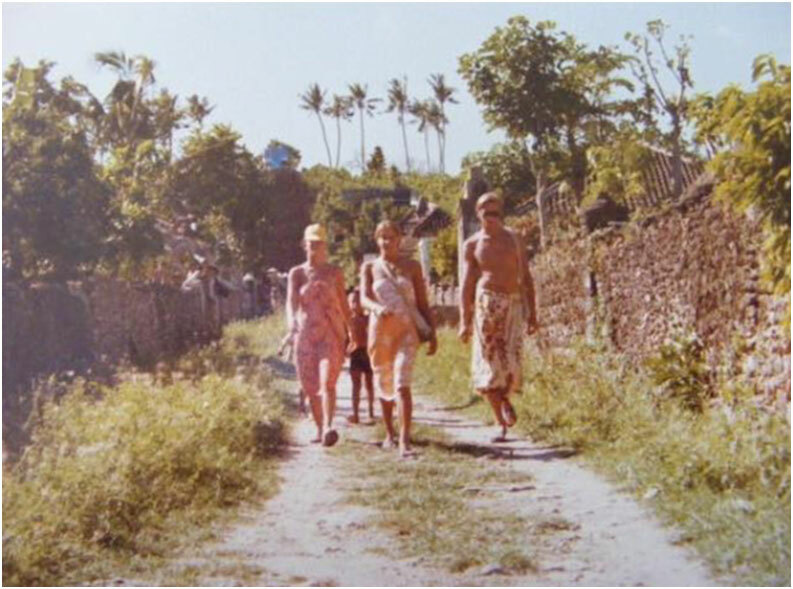 We all wore a sarong and a crocheted top and one of those triangle hard woven planter’s hats. Even the guys wore sarongs. It definitely felt hotter then than it does now! All Bali boys had long hair that was orange, Rolling Stones t-shirts and flared jeans. Nasi, nasi, and more nasi… And you would get sick. All the time! Oh, how I use to dream of a toasted cheese with tomato sandwich. We stayed in thatched roof Losmens’s. There were no hotels. 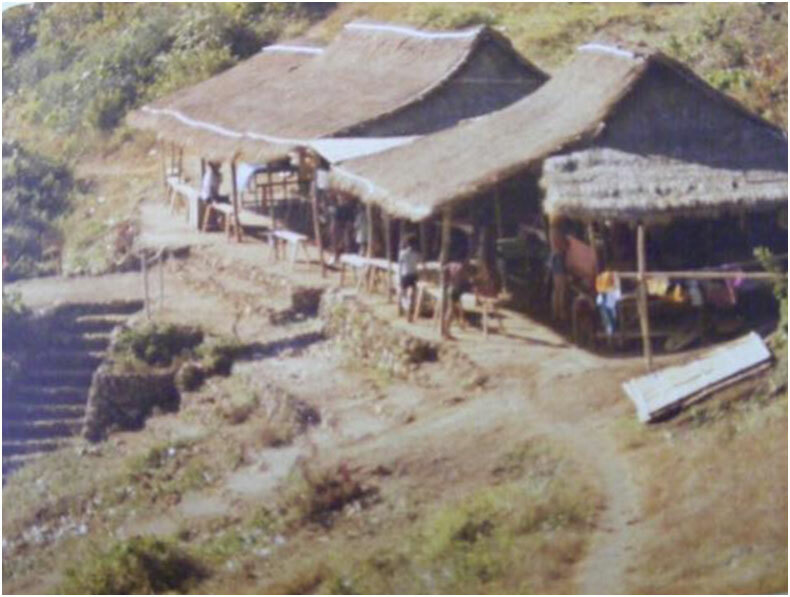 There was little or no electricity in most places or running water. I remember that every single room was painted lime green. That must have been the only color available. There was only one local phone on the island: at the airport. That’s it. We’d use it to call home and ask for more money. Everybody was FKed off about it. It would cut out after three sentences so you had to be quick. Surrounding it on the wall there were tons of graffiti messages cursing it. What kind of board did you surf? Most of the time a Peter McCabe TRADEWINDS 5.6 thruster. Words of encouragement to get out on a board? Who, what, where would you like to be reincarnated as in your next life? Nemo! He’s always searching, seeking and discovering. Just like me. Plus I love his colors. People, the ocean, being here now! You have no choice in Bali. Everything can change in an instant. Now that you’re here, what’s your holiday destination? Nusa Lembongan but don’t let the secret out! It’s the silence and serenity of the Island that keeps me coming back. There’s no noise. Plus, you can escape underwater for hours and loose yourself with the manta rays. It’s incredible! Why did you open Crate and Pretty Poison? It just felt right. What unexpectedly happened at Pretty Poison is that it tapped into the huge underground local skate culture and in a skate bowl there is a huge amount of respect. There’s no aggression. You’re tagged. You do your tricks. Respect. 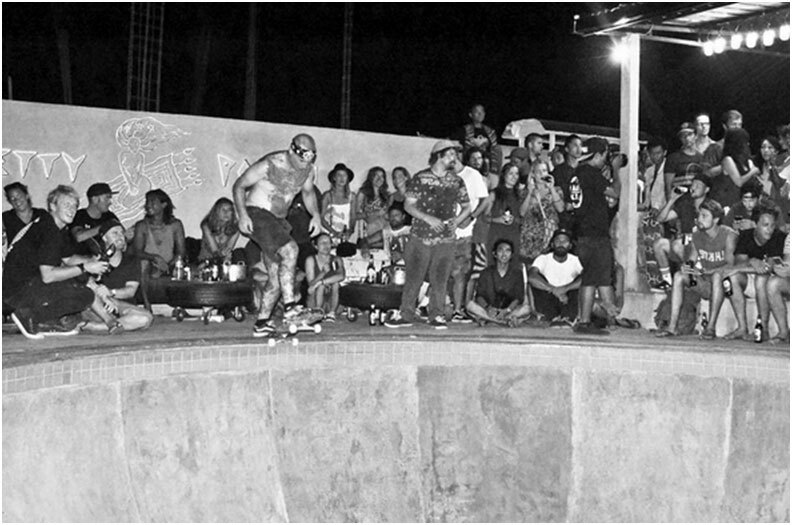 Saturday night, in the bowl, there is tons of comradery and no anger or animosity. It’s great to see it. The place has turned into this awesome mix of expats and locals. It’s great because it’s what I remember Bali to be like. Honestly, I think it really is one of the only few places in Bali where you can see this and I’m super proud of that.